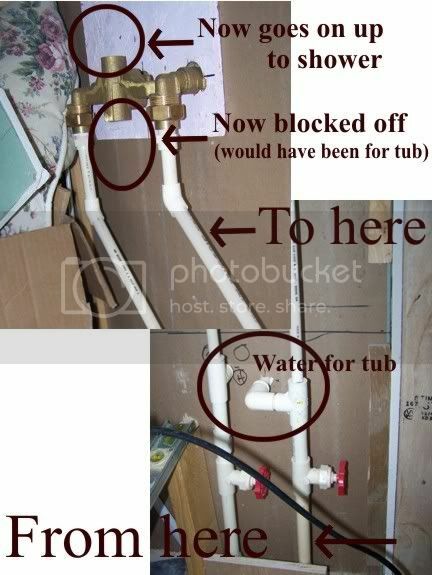 The hardboard shower walls were both easy and difficult. It was easy enough to cut them into the right shape with a circular saw. It was easy to glue them to the walls. But the long wall requires splicing two together. Since I had bought the white plastic connectors, I didn't think there'd be a problem with that. I can be very wrong! Putting the top plastic along the edge was (fairly) easy (1, on the picture farther down the page), but putting two long edges together proved too much for us - one edge, fine. No prob. Joining the second piece, impossible. Eventually, I learned that what you have to do is glue one in place with the connector on it, then bend the other piece up against it. Then you're supposed to be able to snap it in place. We never did succeed. The edge got so torn up from trying, that I gave up and just laid it against the connector, 'repaired' the torn edge with paint and sealer, and glued it down. It does show, but not too badly. I didn't take a pic of it. 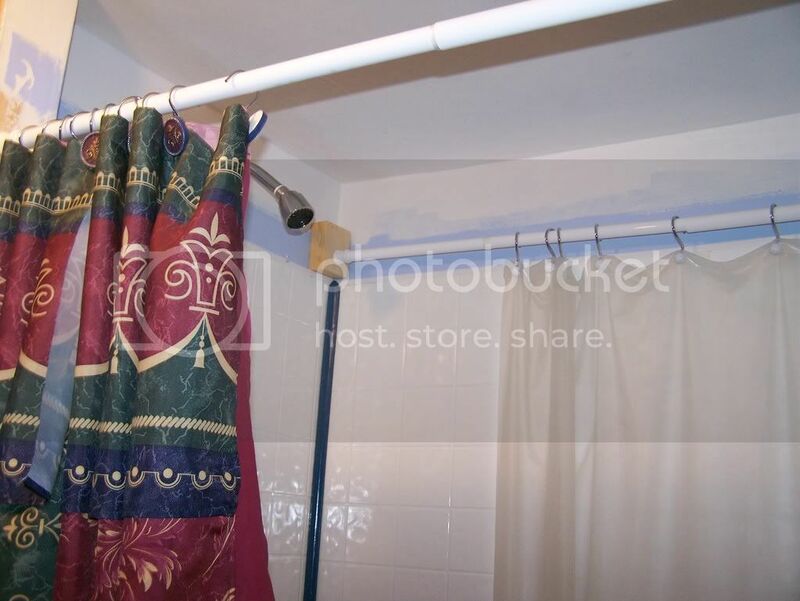 On the back of the shower wall is, of course, the plumbing. I have separated the shower water from the tub water. There is a disadvantage to this in that you can't just turn the shower lever and go from tub water to shower water, but also you can sit in the tub and turn on the water, or you stand in the shower and turn it on without having to bend down; both of which sound good to me. I had to reinforce the wall where the shower head and the shower faucets went through, since it's just wall board, and I don't want anyone yanking them out of the wall! Another problem with getting these walls up was the border at the top (2). It's a beautiful print and irreplaceble (we did try), and I wanted to be able to preserve it and put it back up; it matches the shower curtain and bath mat, among other things. But the top of the shower walls would cover part of it. See when 'they' did the bathroom before, the corner kind of dropped off so the ceiling is about 3" lower there. In order to make it less noticible, I had the border drop there too. So now I had to remove the border before putting up the hardboard. I first tried simply soaking it. But it's so shiny that it's totally impervious to that. I had to peel it back a bit, then stuff soaked paper towels under it. Leaving it to soak for an hour would result in enough glue loosening to be able to peel it back about a half inch. I spent about two weeks working on that. I *think* I will be able to reuse what I took off. I didn't want to try to do the corners with the white plastic connectors. With the experience I now had, I figured it would be impossible to begin with, and in the second place, my corners weren't completely straight, so it wouldn't have worked anyway. The blue trim (3) was Hubby's idea. I coated it with polyurethane for water resistance. 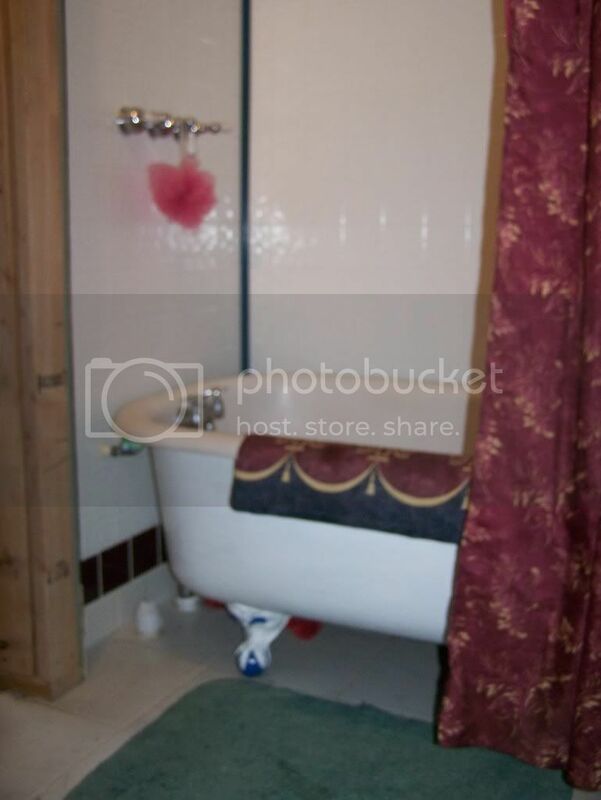 If it was a 'real' shower stall it probably wouldn't last long, but in this situation, it doesn't really get wet. It still wasn't easy getting it up, but I'm sure it was the easiest solution we could have come up with, and I like it. I just put up the towel hook (4). We hadn't had a real place to put a towel, and I had been holding out for 'finishing' the bathroom but, y'know, that may never happen (5). I also put a clothes hook on the back of the door, beside the mirror. 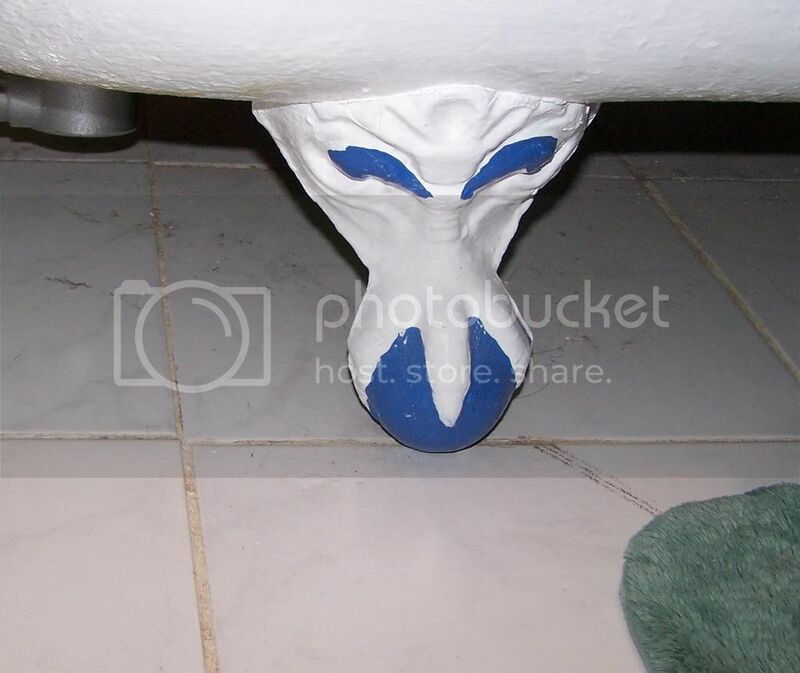 And I painted the balls on the tub's feet. 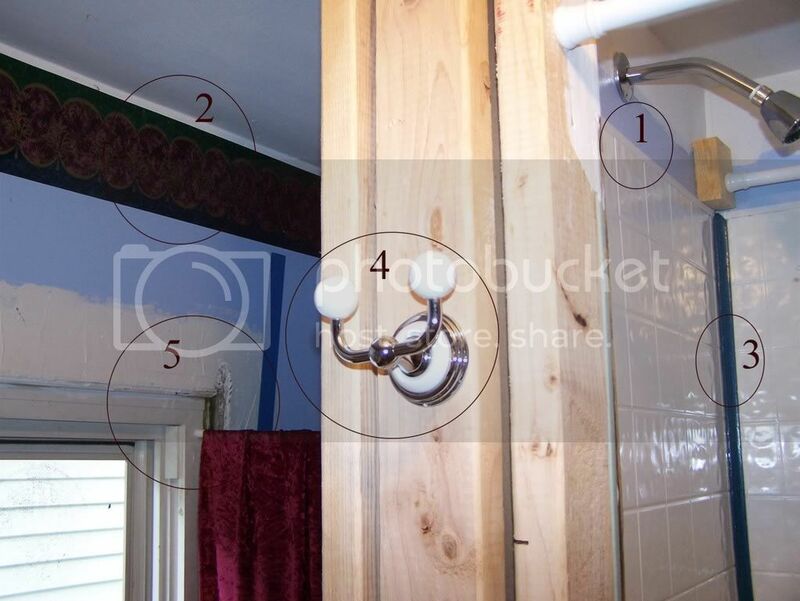 On the second view, you can see the back shower curtain. I will eventually (with luck) fix things so that isn't needed.